At three and a half, Oscar is really starting to understand game play. Sure, we have played Chutes and Ladders with him, and he finally figured out how to hit something on Angry Birds, but until he played Roll & Play, he didn’t really get the concept of playing a game. 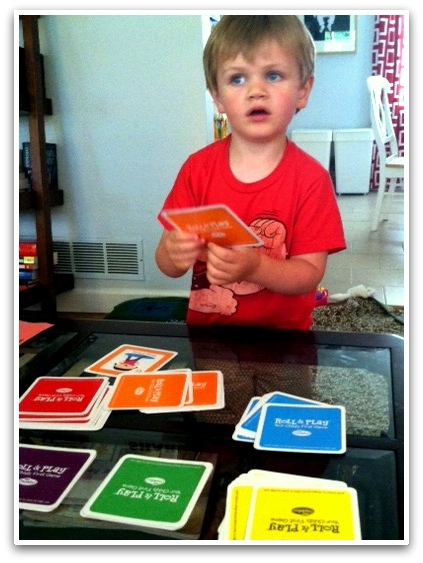 If you are looking for a great first game for your toddler, I highly recommend Roll & Play from Thinkfun! There are several reasons that I wholeheartedly stand behind this game as the perfect “first game” for toddlers. Bright colors – The giant plush block is vibrant and soft. I love the color choices (especially the shades of turquoise and orange) because they aren’t the typical primary colors that are seen everywhere. As a mom to boys, I appreciate the deviation from the typical blue/red/yellow combos that dominate the toy aisles. Easy to play – It only took Oscar one or two rounds to figure this game out. You simply roll the block, choose the card with the corresponding color and complete the action on the card. What I love is that the card has both the words and a picture of the action, so Oscar can actually “read” the instruction himself! And having the printed words will help reinforce his future reading skills. Simple storage – Roll & Play comes with a box to store the cards, but what is extra special is the pocket on one square of the blocks. The cards fit right in there and everything can be kept all together! My playroom thanks you. No loser – I love that this game doesn’t focus on winning. I am not the type of parent who thinks every kid should get a trophy, but when a child is learning the meaning of games, I think focusing on competition isn’t necessary. I love that he is learning how to take turns and follow directions without feeling the pressure to perform well. I usually have something that I could suggest here when I do product reviews. However, Thinkfun really nailed with this game and I have nothing to add. Great job guys!! You can purchase Roll & Play on Amazon or search for a local store here. 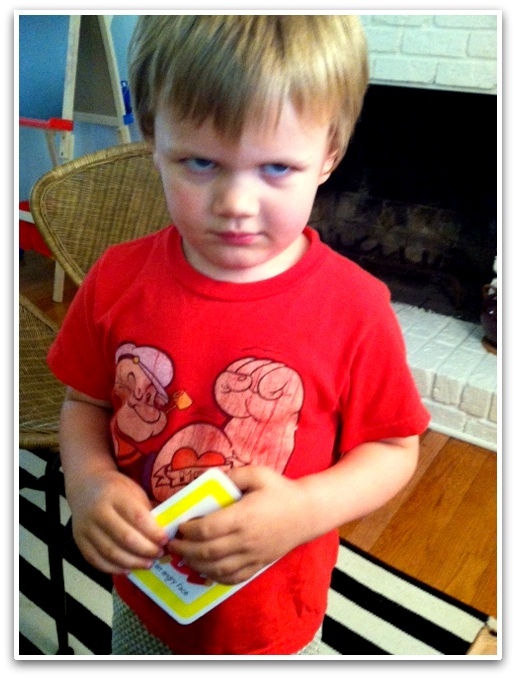 What is your favorite game for Toddlers? Disclosure: I was provided with the above game to facilitate this review. All opinions are my own. Thanks for reading! I just discovered your blog thanks to Erin Lane (A Parenting Production), and this post could not have come at a better time! My son’s 3rd birthday is in June, and I have already found a store where I will be picking up Roll & Play this week. 🙂 My daughter will be a year old in July, so I look forward to her being able to play it a little ways down the road. Thanks so much for the suggestion!